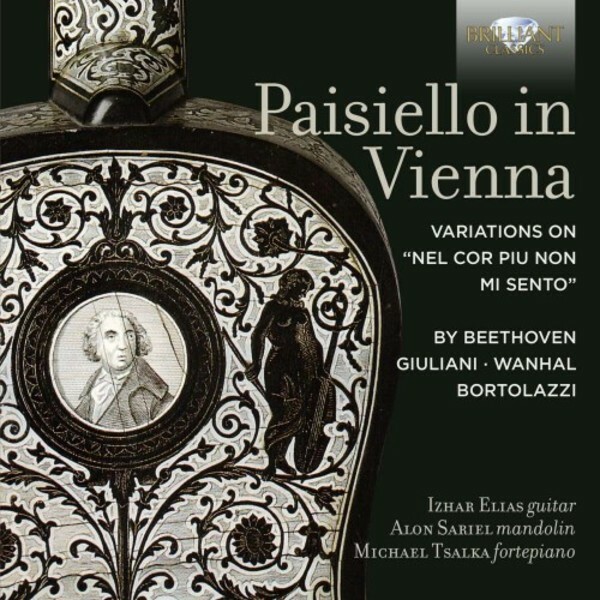 This original concept CD presents one of the most popular opera arias in early‐19th century Vienna, 'Nel cor piu non mi sento', from Paisiello�s opera 'L�amor contrastato', as the basis of a variety of works by a variety of composers: Bortolazzi, Hummel, Giuliani, Vanhal and Beethoven. The aria, in its powerful simplicity, lends itself very well for the variation form and it was gratefully used as a means of instrumental display of brilliance and invention. The basic instrumental ensemble used on this recording is mandolin, guitar and fortepiano - fashionable instruments at that time. The musicians play on historic instruments: Alon Sariel plays a 1850 mandolin, Izhar Elias plays a 1812 Guadagnini guitar and the B�hm 1820 fortepiano is played by Michael Tsalka. The excellent liner notes are written by the musicians.